After an ANZAC memorial to commence the Whole School Assembly this week, we were delighted to acknowledge more than 300 students who received Endeavour Awards. I could easily call these the ‘perseverance and persistence’ awards, the criteria are as follows awarded to one student in almost every class: those who have exhibited outstanding effort over the term, consistent application in class, positive cooperation and thorough completion of homework and assignment tasks. Congratulations to all students who received an Endeavour Award! The Corpus Community would remember Tyler Sandon won the major Fra Angelico Award last year, the major WA Catholic Schools visual arts award. 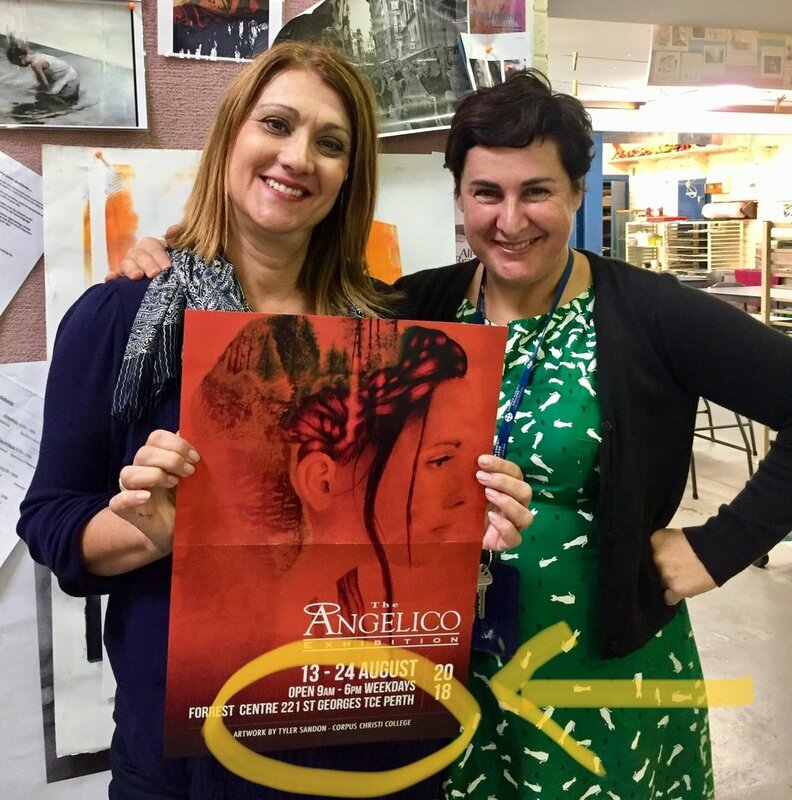 Teachers Gaby Fabris and Julie Pannell are proud that Tyler’s artwork has been reproduced into the Angelico Exhibition poster for 2018. Congratulations! · Chanel Fenwick and Scott Connery will accompany 10 students on the Space Camp to NASA in the USA, who are combining with JohnXXIII College students. They were also fortunate enough to win the ballot to visit the White House, as well! · Caroline Fuhr, Michelle Hunt, and Michael Royall are accompanying the Dance group going to Melbourne. · Sue Cooper and Lidia Di Giuseppe are accompanying the Indonesian Language students on a Language immersion tour of Indonesia, and Joelle L’Aguile and Jean-Paul Papineau are accompanying a group of French students who are going to Reunion Island, also for a Language immersion tour. I think most parents would be aware the official drop-off and pick up area for students is the area in front of the College. The reason for these guidelines is to maximise the safety for our students. I would appreciate it, if parents could please note these instructions for the commencement of Term Two. Leaving us at the end of term include Dance and English teacher Lauchlan Bain, Library Project Officer Victor Chan, Physics teacher Patricia Histed, and Mathematics teacher Justine Callaghan. We thank these staff who have mostly covered those who are on leave. We also wish those staff who are on leave next term all the best: Home Economics teacher Marie Drygan and Teaching Assistant Jody Driver, whilst Head of Year Ten Scott Connery has accepted a secondment to Sacred Heart School Beagle Bay for Terms 2 and 3. Chanel Fenwick has accepted the role as Head of Year whilst Scott is in the Kimberley region. Finally, to all our students and staff, please have a restful Term One holiday, ready to return on the first day of term, which for all will be Tuesday 1 May. We will be wearing our full winter uniform, with photo day scheduled for Wednesday 2 May, and with parent-teacher-student interviews on Tuesday 1 May, the first week will be a busy one.